Tofu dishes are tend to be light, but Mapo-Tofu Don is different. The lightness of Tofu and the heaviness of meat, and more than that, the easiness of the way of serving over rice, make it great! In food section of the Kurosaki Sogo department store, Tofu (Momen-style), which is a little bit bigger than generally sold tofu, made with Natural Nigari is sold at the price of 185 yen. I am used to use this as Hiyayakko, or Chilled Tofu, and Yudofu, or Tofu in Hot Water. I often forget tofu left inside refrigerator, and I remember it next day. In that occasion, it is useful for use for Mapo-Tofu. cooking this dish seems difficult, but if you have seasoning for this, it is very simple. In Chinese cusine, a lot of seasoning are used, so you should better have high quality ones. Chinese sweet bean paste made with wheat flour. I think these three seasoning (ingredients) are the key. 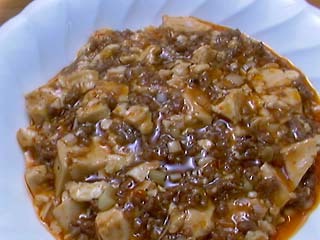 According to the Reference material No.2 above, Mapo-Tofu is introduced to Japan by Ken-min Chin at the time his visit in Japan in 1952. Formally, it is called Chin's Mapo-Tofu. However, the recipe in Reference material No.2 above, no Douchi (Salted Black Bean) is used. On the other hand, Mr. Shu uses Oister sauce and Haisen Jan (hoisin sauce) for extra flavor. In Ms. Asada's recipe, Japanese red Miso is used. This substitution is because of the fact: we do not have Douchi (Salted Black Bean) and Tienmen Jan (Sweet Bean Sauce) in ordinal japanese home. But it is no match to those seasonings listed above. In my experience of cooking this dish, I feel that the effect of Douchi (Salted Black Bean) is relatively big. Douchi (Salted Black Bean) is granular, so chopping into fine pieces is a knack. And by roasting those seasoning, spicyness and aroma are increased; so this is another knack roasting after adding seasoning. When you think of cooking this dish, first Tofu (bean curd) should be drained off. You do not have to press with heavy plate for this purpose, but just tilting cutting board and putting tofu on it for 20 to 30 minutes is enough. And, when I mention Tofu (bean curd), it is hard one, or Momen-style. I use the seasonings as shown in photo. Use granular style chicken bone soup, put it into a cup with water, and microwave them. It is easy. Douchi (Salted Black Bean) should be finely chopped into pieces. First, saute minced ginger and garlic throughly with low flame. After that, with high flame, saute ground pork. Saute them obserbing the changing of color, and this is a thrilling experience. Once well sauted, with lowerd to medium flame, add Douchi (Salted Black Bean) and saute more, and then add Touban Jan and Tienmen Jan and saute more. The saute process is important. Note: In Reference materials 1, 2, and 3, ground pork is sauted first, and then ginger and garlic are added. I just got accustomed to do like this, because of Daikon Pirikara-Ni (Boiled Spicy Daikon) dish, which required that method. Those references may be right. As arome rises, put one cup of chicken bone soup, microwaved, to it, and after boiled put Tofu (bean curd) and boil it for a while. After that put sake and soy-sauce to taste, boil several minute more with low flame, and add coasely chopped green onion to it. With medium flame, add potato starch solution for thickness. Then, with high flame, heat up the pot, and finally, pour some sesami oil to the surface of the pot to glaze.